Is This Crazy Weather Making You Sick? It just might be, and you can do a lot at home to safeguard yourself and your family. Just the other day it was 93 degrees here in Pearl River, NY. In spite of that, I wouldn’t be surprised if in a few weeks we had 40 degree weather, a blizzard, or for it to start raining Billy Goats or something. I think we’ve all noticed that the weather is downright bizarre these days. Have you ever felt like the constant roller-coaster of weather change is making you sick? Recent research says you are probably right. If you’ve felt ill, achy or irritable, it might be more than just “the usual” draining you. Research indicates that fluctuating weather can and does have many different negative impacts on your health. Severe headaches can occur when there’s a high pressure system in place. Many studies have associated pressure changes with triggering migraines. Changing seasons and hot weather can exacerbate asthma and allergy symptoms. This is especially true in the springtime. According to the Weather Channel, the weather’s impact on your body is so varied, there’s a whole scientific study devoted to it called Biometeorology. These circumstances can align against you, possibly triggering migraines, headaches, sinus pressure and more. Another finding even shows low pressure systems can cause our blood-pressure to drop. This can make you feel like your energy is being drained from you. Even how your blood sugar is controlled is impacted on low pressure days which can also affect diabetics. The weather also can have indirect influences on our health. One myth that has been dispelled by medical professionals is that cold weather causes illness. Those same medical professionals do agree that incidental situations caused by cold weather do cause illness. The big culprit these days are air tight homes, poor air filtration and disinfection, as well as dry air. During very hot and cold weather, people mostly stay inside. Newly constructed homes have a tendency to be very airtight. This is excellent for energy conservation, but has been linked to many health issues. Locking yourself in with essentially the same air all day long bombards you with whatever illnesses people bring into that space. Exposure alone isn’t a guarantee you’ll get sick. To help stop the frequency of colds this winter season, Hutzel suggests washing your hands frequently and using a whole home humidifier to counteract some of that dryness in the air. There are humidifiers, air cleaners and UV disinfection units available for most central air systems. These can reduce bacteria, viruses and mold. While there’s little you can do to control the weather, you can stay ahead of it and be prepared to limit bad experiences. Tracking the weather weekly and daily takes only a few moments and can give you valuable information. Fresh air systems for the more air-tight homes allow the removal of stale, infected air from your home without really damaging your energy conservation. Humidifiers can be integrated into your air system as well as UV disinfection units. The weather has certainly been crazy, and it probably won’t let up any time soon. You take care of your family, but make sure to take care of yourself as well this season. Is your home properly filtered? What about fresh air? Do you have a UV cleaner? Is the bulb still good? What’s your home-humidity level on the driest days? Message us below to find out. 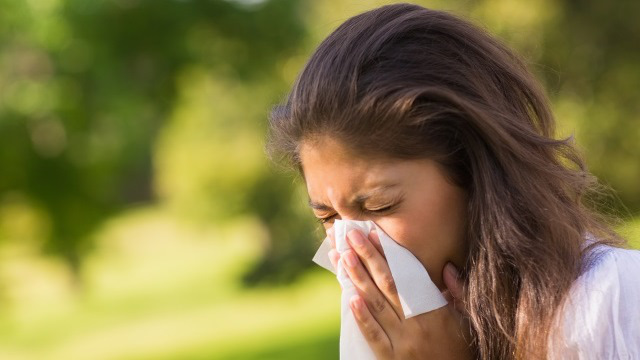 If you notice any patterns such as getting headaches on high pollen-count days even when you’ve been inside mostly, or waking up with dry nasal passages, let us know what’s going on with you below. We can use that information to help us determine which products and services will help you the most. We want to help you stay cool and calm, safe and cozy all year long.